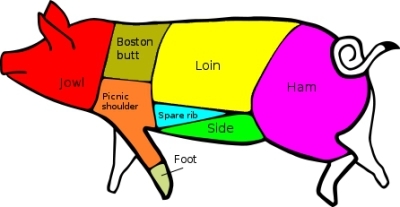 2) Actually, I love all the parts of a pig: pork chops, pork loin, pork roast, you name it. The last time I was at the pet store, I stared for too long at the pig hooves for sale in the dog-chew department, wondering if the mutt and I could take advantage of the two-for-one special. 3) I find pigs themselves dangerous and terrifying. A few years ago I was chased into the Sabine river in Louisiana (while fishing from its banks) by a huge, six-hundred pound sow. As it turned out she merely wanted to be petted, which several small children were only to happy to do. Meanwhile, I fought a desperate struggle for life in the swift current and emerged, sputtering and grateful for God’s mercies, two-hundred yards downstream. 4) I am convinced that a bacon scented perfume would be a billion dollar seller; I myself would follow a woman similarly fragranced to the very ends of the earth, perhaps explaining why no one else has tried it. 5) My girls basketball team once made me chocolate cupcakes with bacon in them. While I would have preferred they contain the fried variety as opposed to Bacon Bits, they were delicious nonetheless. I appreciated both their thoughtfulness and the fact that no one else wanted any and I didn’t have to share. 6) I abhor broccoli regardless of presentation. 7) I can sense broccoli’s presence in any dish, no matter how insidious the chef’s attempt to hide it. 8) Any food that, when cooked, smells like the cholera ward in a Bangladeshi hospital, is unfit for human consumption. Whenever my wife cooks broccoli, I leave the cat box untended for several days to neutralize the odor. 9) If I were forced to eat only broccoli as a means of dieting, I would lose weight at an incredible rate because I would kill myself. 10) If broccoli were somehow transformed into woman, she would resemble Medusa, or perhaps Mrs. Potato Head. Bacon, conversely, is bikini-clad Heidi Klum. 11) If broccoli was a car, it would be a Yugo. 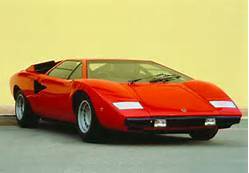 Bacon is a cherry red Lamborghini Countash. 12) Broccoli is named after Salvatore Broccoli, an incompetent ninth-century Italian farmer who, despite his best efforts at raising a desirable crop, managed only to cultivate a vile weed which grew rampantly in his fields. Desperate for money, he took his harvest to market and, much to his great joy, discovered there were no small number of people lacking refined senses of taste or smell. 13) I made that up. 14) The turnip is the root of all evil. 15) I think about food a lot. 16) I have, at present, ten cats living in my home. Of those ten, perhaps three are pleasing to me. The rest I regard as mere sources of foul emanation, floating hair, senseless destruction and spontaneous shrieks that cause me to momentarily flat-line and then soil myself. 17) Despite this invasion of unwanted beasts, I remain king of the house, master of my domain: nothing happens in my home without my tacit assent or outright say-so. 18) I made that up too. 19) My wife appreciates that I am a take-charge man; I am confident and supremely competent in my role as provider; I tackle things head on and get stuff done. My wife is therefore free to assume the traditional role of homemaker, free from the stress and strife of everyday life. 20) I may have a slightly elevated sense of self, a deluded view of the world around me and my corresponding place in it. This entry was posted in Blogging, Facebook, Food, Humor, Life, Living, Uncategorized and tagged Animals, Facebook, Food, humor, Life, Living, Marriage. Bookmark the permalink. That pig was enormous and moved like a gazelle. I was unsure of its intentions and acted accordingly. Those kids were stupid. So there. I liked this blog so much, I’m going to SHARE it on FACEBOOK. That’s so nice of you; thank you for that! No matter your defense, I’m still laughing! You left out the part where you screamed like a little girl. Umm…sometimes I have to leave things out for reasons of flow and brevity. You understand. This post is so funny, and I’m seriously impressed that you managed to come up with 21 facts about yourself. I had a similar “uh oh” – I’d clicked “like” because, believe it or not, I liked something the person had said. She gave me the number 20. Is it bad that I just pretended it never happened? Not only is it not bad, but I think it’s good to do your part to stomp out silly games of “tag” on Facebook. I didn’t ask anyone else to do it, that’s for sure. Everyone who wonders what became of the chain letters they sent? They stopped with me! I’m glad you liked it; thanks for reading! Amen to this hilarious post!! Please come visit me at Mainstream Jane.